If you want a better understanding of the difference between average home values and average home prices, simply follow our review of 32309 home sales because it is a perfect case study. Nearly every real estate blog and real estate news reporting agency likes to relate real estate appreciation or real estate depreciation with the movement of average home prices, but this is a terribly misleading practice. 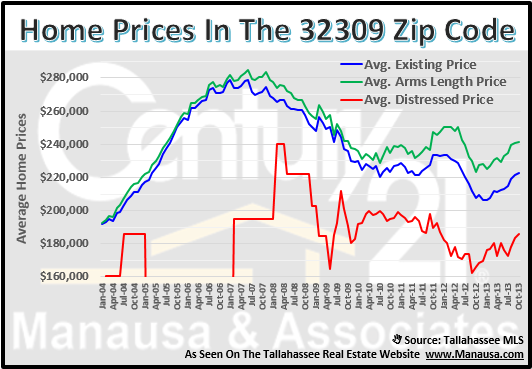 Let's examine how an analysis of a single zip code (32309 home sales) can show why you cannot infer appreciation from average sales prices any more than you can compare apples to oranges. The following real estate graph shows the number of 32309 home sales each month (blue bars) as well as the average home price trend since 2003. Based upon the information above, we can see that the average sales price of a 32309 home has bounced around for the past three years. If we were to rely solely on this information, one could have believed homes were first appreciating and then depreciating since 2009. But this is simply not true. 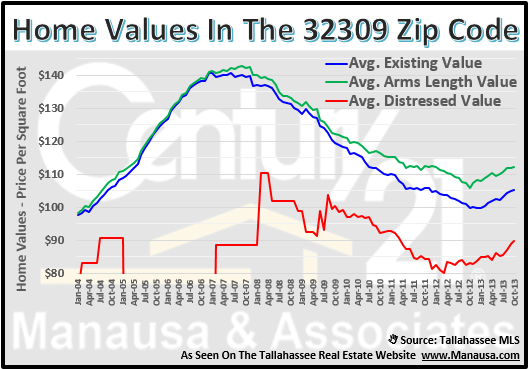 How many people who were trying to sell a home in the 32309 zip code were mislead into believing that values were rising? This next real estate graph shows the number of 32309 home sales in blue, and the average price per square foot. By tracking the average price per square foot over time, we get a much more accurate representation of real estate depreciation (or appreciation) then by tracking to average sales prices. Note that the trend of home values has been fairly consistently declining since early in 2007. That means that anybody reporting "recovery" or "appreciation" for 32309 home sales was not understanding what the market has been telling us. Finally, we can view the "proof" that movement in the average (and even median) home prices do not represent appreciation or depreciation in real estate. Why? Because you are not comparing apples to apples! Think about it. With lower interest rates, buyers can afford to spend more money on a home without raising their monthly mortgage payment. Now, do you think that this means they will just pay more for a home, or will they go out and get "more home?" 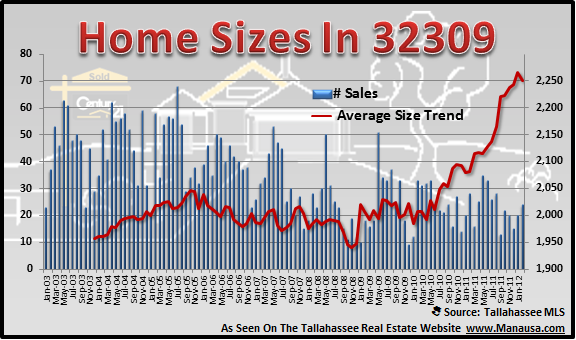 The graph above clearly shows that people who purchased a 32309 home in the past were buying a bigger home. The average size of homes sold in the 32309 zip code is at an all time high, meaning people are spending their money on larger (nicer) homes. I have said it before, and it is worth repeating because so many news agencies are misleading consumers about current value trends in the real estate market. The change in average home prices are due to the buying power and posture of home buyers, whereas the change in home values is due to the relationship between supply and demand. Over the long run, home values and home prices should generally move in the same direction, but in the short run, it is quite possible for them to move in opposite directions. If you want to know whether the market is appreciating or depreciating, you have to look at home value trends, not average home price trends. Based upon the three graphs above, you should have a clear understanding of the lack of significance of real estate reports that spew erroneous conclusions based upon what the average sales price of homes are doing. Use this knowledge to your advantage! I hope this 32309 home sales report has been enlightening, and if you want to work with real estate agents who can guide you safely through this housing market, just drop me a note and we can schedule an initial consultation to review your specific wants and needs.